Windows Phone 8 won’t just be bringing a flashy new start screen, and new applications, but a lot of support features too. Microsoft is always expanding the Windows Phone market globally, and with Windows Phone 8 Microsoft is going to support up to 50 languages. Supporting up to 50 languages means double the current geographic coverage for Windows Phone. Not only will language support multiply, but the Windows Phone marketplace will also be expanded to support downloads in up to 180 countries. That download support number triples the current footprint of countries supported by the marketplace. Number one is pretty self explanatory, no more fussing around to find your Windows Phone USB and then plugging it in to your computer and so on. You download updates over the air when available, enough said. Number two, well, we won’t rely on this too much. Support updates for at least 18 months is a great thing, but it doesn’t mean all bugs and issues will still be fixed on a timely manner, if corrected at all. 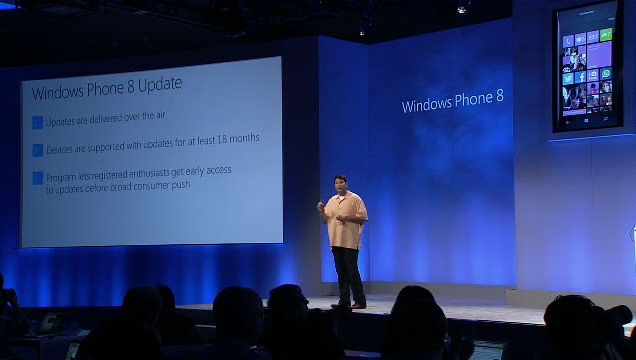 Number three is great, it is Microsoft’s gift to the biggest Windows Phone fans and enthusiasts. You can count on us registering for the early access update program, that’s for sure!